In this hearty dish, cabbage leaves are stuffed with a seasoned lamb and rice mixture and cooked in a mild garlic tomato sauce. Using a knife, cut around core of cabbage and remove core. Place head of cabbage, core side down, in a large pot. Cover with water, and cook over high heat for 30 minutes. Drain, cool cabbage, and separate leaves. You need 24 leaves. In a large bowl, combine long-grain rice, lamb, 1 tablespoon minced garlic, 1 teaspoon salt, and [1/2] teaspoon black pepper. In a 2-quart pot, combine tomato sauce, water, remaining 3 tablespoons garlic, mint, remaining 1 teaspoon salt, and remaining [1/2] teaspoon black pepper. Lay each cabbage leaf flat, spoon 2 tablespoons filling on each leaf, and roll. 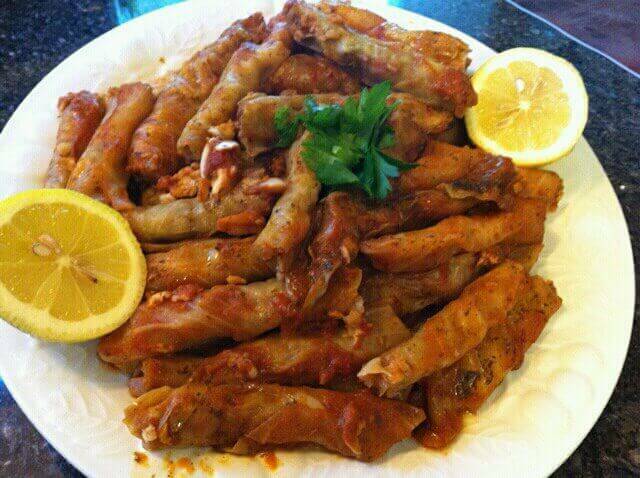 Layer rolls in a large pot, pour sauce into the pot, cover, and cook over medium-low heat for 1 hour. Let rolls rest for 20 minutes before serving warm with Greek yogurt. If the cabbage leaves are too large, you can cut them in half when making these cabbage rolls.